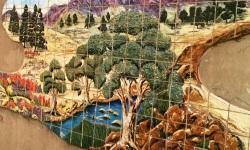 The beautiful work of art is a mural made up of 2,500 hand made and painted tiles. This very special display tells the story of Port Augusta in a very artistic, interpretive way. It was created by Dianne Turner and local Port Augusta artists. The mural was funded by the Port Augusta City Council and Country Arts South Australia.